In this application protocol, pan T	cells	are	isolated	directly	from	human	PBMCs by	magnetic	enrichment	using the	Pan T	Cell	Isolation	Kit,	human and	subsequently activated	and	expanded	with	the	T	cell	Activation	and	Expansion	Kit,	human. T	cell	purity,	proliferation, and expression of activation	markers are assessed	by	flow	cytometry	at	different	time	points. PBS-EDTA:	Phosphate-buffered	saline	(PBS),	pH	7.2,	with 2	mM	EDTA. ▲ Note:	With	the	Gas-permeable	Culture	Plate,	up	to 2.5×107 cells/well/mL	can	be	stimulated	as	opposed	to	1×107 PBMCs/well/mL	in	standard	24-well	plates. ▲ Note:	The	MACSQuant	VYB	cannot	be	used. MACSQuant Calibration	Beads	(#	130-093-607),	when	using	the	MACSQuant Analyzer	or	MACSQuant Analyzer	10. Dilute	cells	with	2–4×	the	volume	of	PBS-EDTA buffer. Fill	the	conical	tube	with	PBS-EDTA,	mix,	and	centrifuge	at	300×g	for	10	minutes	at	20	°C. Carefully	remove	supernatant	completely. For	removal	of	platelets,	resuspend	the	cell	pellet	in	50	mL	of	PBS-EDTA	and	centrifuge	at 200×g	for	10–15	minutes	at 20	°C. Carefully	remove	the	supernatant	completely. Resuspend	cell	pellet	in	an	appropriate	amount	of	PBS-EDTA	and	proceed	to	"Isolation of human Pan T cells". Work	fast, keep cells cold, and	use	precooled	solutions	(2–8	°C). Volumes	for	magnetic	labeling	given	below	are	for	up	to 1×10⁷	total	cells. When	working with	fewer	cells,	use	the	same	volumes	as	indicated. When	working	with	higher	cell	numbers,	scale	up	all	reagent	volumes	and	total	volumes	accordingly. For	optimal	performance	it	is	important	to	obtain	a	single-cell	suspension	before	magnetic	labeling. Determine	cell	number of	PBMCs. Resuspend	cell	pellet	in	40	µL	of	buffer	per	1×10⁷ total	cells. Add	10	µL	of	Pan	T	Cell	Biotin-Antibody	Cocktail	(contained	in	the	Pan	T	Cell	Isolation Kit,	human)	per	1×10⁷ total	cells. Add	30	µL	of	buffer	per	1×10⁷	total	cells. Add	20	µL	of	Pan	T	Cell	MicroBead	Cocktail	per	1×10⁷	total	cells. Mix	well	and	incubate	for	10	minutes	in	the	refrigerator	(2–8	°C). ▲ Note: A	minimum	of	500	µL	is	required	for	magnetic	separation. If	necessary,	add	buffer	to	the	cell suspension. Always	wait	until	the	column	reservoir	is	empty	before	proceeding	to	the	next	step. Choose	an	LS	Column	and	a	suitable	MACS Separator. Place	LS	Column	in	the	magnetic	field	of	a	suitable	MACS Separator. For	details	refer	to the	respective	MACS Column data	sheet. Prepare	column	by	rinsing	with	3	mL	of	buffer. Apply	cell	suspension	onto	the	column. Collect	flow-through containing	unlabeled cells,	representing	the	enriched	T	cells. Wash	column	with	3	mL	of	buffer. Collect	unlabeled	cells	that pass	through, representing	the	enriched	T	cells,	and	combine with	the	effluent	from	step	3. (Optional)	Remove	column	from	the	separator	and	place	it	on	a suitable	collection tube. Pipette	5	mL	of	buffer	onto	the	column. Immediately	flush	out	the	magnetically	labeled	non-T	cells	by firmly	pushing	the	plunger	into	the	column. Store	master mix	in	the	dark	in	the	refrigerator	(2–8	°C)	until	use. Do	not	store	for	extended periods. This	step	is	optional. Additional	antibodies	can be	included	in	the	analysis according	to	the respective	needs. Learn more about our antibodies and dyes. Remove	a	small	aliquot	from	the	fraction	representing	the	enriched	T	cells (e.g. 50	µL). Centrifuge	cell	suspension	at	300×g	for	10	minutes. Aspirate	supernatant	completely. For	each	sample, resuspend	up	to	1×106 nucleated cells in	100	µL phenotyping	master mix	(see antibody panel for phenotyping in "Things to prepare in advance"). Mix	well	and	incubate	for	10	minutes	in	the	dark	in	the	refrigerator	(2–8	°C). ▲ Note: Higher	temperatures	and/or	longer	incubation times	may	lead	to	non-specific	cell	labeling. Working	on	ice	requires	increased	incubation	times. Wash	cells	by	adding	1–2	mL	of	buffer	and	centrifuge	at	300×g	for	10	minutes. Aspirate supernatant	completely. Resuspend	cell	pellet	in	a	suitable	amount	of	buffer	(e.g., 500	µL)	for	analysis	by	flow	cytometry. ▲ Note:	Add	propidium	iodide	according to	the	manufacturer’s	instructions	before	flow	analysis. Flow	cytometry analysis	of	T	cell	purity	after	magnetic	separation. Separation	of	untouched	T	cells	from	human	PBMCs	by	depletion	of	non-T	cells	using	the	Pan	T	Cell	Isolation	Kit	(human),	an	LS	Column,	and	a	MidiMACS™	Separator. Cells	were	labeled	with	CD2-PE	and	CD3-FITC	and	analyzed	by	flow	cytometry	using	the	MACSQuant® Analyzer. Separation	of	untouched	T	cells	from	human	PBMCs	by	depletion	of	non-T	cells	using	the	Pan	T	Cell	Isolation	Kit	(human),	an	LS	Column,	and	a	MidiMACS	Separator. Cells	were	labeled	with	CD2-PE	and	CD3-FITC	and	analyzed	by	flow	cytometry	using	the	MACSQuant Analyzer. Prepare	the	10	mM	CFSE	stock	solution	by	dissolving, e.g., 5.57	mg of	CFSE	(MW	557.46)	in	1	mL	of	DMSO. Use	CFSE	at	a	final	concentration	of	1	µM	by	diluting the	stock	solution 1:10,000	(e.g., 1	µL CFSE	stock solution	per	10	mL	cell	suspension	in	PBS). Aliquots of	the	stock	solution should	be	stored	at	–20	°C	or	below. Avoid	repeated	freeze-thaw	cycles. Prepare	TexMACS Medium	supplemented with	human IL-2 (50	IU/mL). ▲ Note: Make	sure	to	add	IL-2	freshly to	the	T	cell	medium	for	cell	expansion. ▲ Note: Instead	of	TexMACS Medium,	RPMI	supplemented	with	FBS	(10 %	final concentration),	100× L-glutamine	stock	solution	(1%	final	concentration),	2-mercaptoethanol	(0.01	mM	final concentration) and	human	IL-2	(50	IU/mL)	can	be	used	for	T	cell	cultivation	and	expansion. ▲ Note: Addition	of	penicillin/streptomycin	to	the	T cell	medium is	optional	(e.g., 100× penicillin/streptomycin stock	solution	to	a final	concentration	of	1%). CFSE	is	added	to	the	freshly	isolated	Pan	T	cell	suspension	to	assess	cell	proliferation	at any	given	time	point	and	for every	condition	tested. Therefore,	please	do	not	use	antibodies for	flow	analysis conjugated	to	fluorochromes	that	exhibit	the	same	spectrum	as	CFSE (λex 492 nm;	λem 517 nm). Alternatively, a separate	well	in	the	cell	culture	dish	can	be	used	for	CFSE	labeling. Please	make	sure	to prepare	at	least	one	additional	well	per condition	(e.g.,	stimulated	and	non-stimulated	control). Cell	proliferation	is	usually	analyzed	on	days	6,	8, and	10. However,	please	feel	free	to choose	time	points that	are	appropriate	for your	experimental	needs (see	"Flow cytometry analysis	of	cell	proliferation	and	expansion	rates"). To	assess	expansion	rates,	please	also	determine	cell	numbers,	e.g.,	on days	3, 6,	8,	10,	13, and	14	using,	e.g., a	Neubauer	Chamber	or	the	counting	function	of	the	MACSQuant® Analyzer 10 see	"Flow cytometry analysis	of	cell proliferation	and	expansion	rates". Resuspend	cells	to	a	final	concentration	of	2×107	cells/mL in	PBS. Add	the	CFSE	stock solution to	a	final	concentration	of	1 µM to	the	cell	suspension	(e.g.,	add	1	µL 10	mM	CFSE	stock	solution	to	10	mL	cell	suspension). Mix	well	and	incubate	for	10 minutes at	37 °C. Add	one	volume	of	human	AB	serum, mix	well	and	incubate	for	5	minutes	at	room	temperature (e.g.,	add	10	mL	human	AB	serum to	10	mL	cell	suspension). Resuspend	cells	to	a	final	concentration	of	2×107	cells/mL	in	TexMACS™ Medium	without	supplements. Repeat	steps	7	and	8 to	wash	cells	twice. ▲ Note:	After	the	last	wash	resuspend	cells	in	fresh	TexMACS	Medium	supplemented	with	IL-2. Cells	are	now	ready	for activation and expansion. Proceed to "Activation	and	expansion of human Pan T cells". Prepare	TexMACS™ Medium	supplemented with	human IL-2 (50	IU/mL). ▲ Note: Instead	of	TexMACS Medium,	RPMI	supplemented	with	FBS	(10%	final concentration),	100× L-glutamine	stock	solution	(1%	final	concentration),	2-mercaptoethanol	(0.01	mM	final concentration) and	human	IL-2	(50	IU/mL)	can	be	used	for	T	cell	cultivation	and	expansion. It	is	recommended	to	reconstitute	lyophilized	Human IL-2 IS,	premium grade	with	deionized sterile-filtered	water	to	a	final	concentration	of	0.1–1.0 mg/mL	in	a	volume	of	at	least	100 µL. ▲ Note:	Further	dilutions	should	be	prepared	with	0.1%	BSA	or	human	serum	albumin	(HSA) in	PBS. The	ED₅₀	is	≤0.2 ng/mL	corresponding	to	a	specific	activity	of	≥5.0×106 IU/mg (calibrated	with	NIBSC 86/504)	or	≥1×10⁷	IU/mg	(calibrated	with	Proleukin®). Recommended	stock	concentration:	0.1mg/mL	by	reconstituting	a	10	µg	vial	of Human IL-2 IS,	premium grade	with	100	µL deionized	sterile-filtered	water. This	results	in	a	final	activity	of	500 IU/µL. Upon	reconstitution	aliquots	should	be	stored	at	–20	°C	or	below. Avoid	repeated	freeze-thaw	cycles. To	obtain	a	cell	culture	medium	supplemented	with	50 IU/mL,	add	1.0 µL reconstituted	Human IL-2 IS, premium grade	freshly to	10	mL	cell	culture	medium. Resuspend	Anti-Biotin	MACSiBead Particles (contained	in	the	T	Cell	Activation/Expansion	Kit) thoroughly by	vortexing	before	use,	to	obtain	a	homogenous	suspension. Anti-Biotin	MACSiBead Particles	are	supplied	without	preservative. Remove aliquots	under	aseptic conditions. It	is	recommended	to	load	Anti-Biotin	MACSiBead Particles	in	batches	of	1×108 particles. Loaded	AntiBiotin MACSiBead Particles	are	stable	for	up	to	4	months	when	stored	at	2–8	°C. Pipette	100	µL	of	CD2-Biotin,	100	µL	CD3-Biotin	and	100	µL	CD28-Biotin	into	sealable	2 mL	tube	and	mix	well. ▲ Note: This	antibody	combination,	with	a	final	antibody concentration	of	10	µg	per	antibody	per	1 mL	of	loaded	Anti-Biotin	MACSiBead Particles,	is	optimized	for	achieving	maximal	T	cell	activation. Resuspend	Anti-Biotin	MACSiBead Particles	thoroughly	by	vortexing. Remove	500	µL	Anti-Biotin	MACSiBead Particles	(1×108 AntiBiotin	MACSiBead Particles) and	add	to	antibody	mix. Add	200	µL	buffer	to	adjust	to	a	total	volume	of	1 mL. ▲ Note: Anti-Biotin	MACSiBead Particles	can	be	loaded in	a	flexible	manner	with	biotinylated	antibodies	or	ligands	other	than	those	supplied in	the	T	Cell	Activation/Expansion	Kit,	human. If	desired,	add	other	biotinylated	antibodies	or	ligands	at	appropriate	concentrations	and	adjust with	buffer	to	a	total	volume	of	1	mL,	accordingly. Incubate	for	2	hours	at	2–8	°C	under	constant,	gentle	rotation	by	using	the MACSmix™ Tube	Rotator	at	approximately	4	rpm	(slowest	permanent	run	program). The	loaded	Anti-Biotin	MACSiBead Particles	(1×108 particles/mL)	are	now	ready	to use. Do	not	remove	the	loaded	Anti-Biotin	MACSiBead Particles	from	the	antibody	mix. Store	at	2–8	°C	for	up	to	4	months. Resuspend	loaded	Anti-Biotin	MACSiBead Particles	thoroughly	and	transfer	10 μL	(1×10⁶ loaded	Anti-Biotin	MACSiBead Particles)	per	2×10⁶ cells	into	a	suitable	tube. ▲ Note:	If	unloaded	MACSiBead™Particles	will be	used	for	negative	control	experiments,	replace	the	loaded	AntiBiotin	MACSiBead Particles	with 10 μL	(1×10⁶ beads)	of unloaded	Anti-Biotin	MACSiBead Particles	per	2×10⁶ cells. Add	100–200	µL	of	TexMACS Medium	without	supplements	to	the	loaded	Anti-Biotin MACSiBead Particles	and	centrifuge	at	300×g	for	5	minutes. Aspirate	supernatant	and	resuspend	loaded	Anti-Biotin	MACSiBead Particles in	100	µL of fresh	TexMACS Medium	supplemented	with	IL-2. Resuspend	cells	at	a	density	of	2×10⁶ cells	per	900	µL	of	TexMACS Medium	supplemented	with	IL-2. Add	the	prepared	Anti-Biotin	MACSiBead Particles	from	step	3	to	the	900	µL	of	cell suspension	and	mix	well. Dilute	cells	with	TexMACS Medium	supplemented	with	IL-2 to	a	final	density	of 1×106 cells	per	mL	per	cm2 and	add	the	mixture	to	a	suitable	cell	culture	vessel	(e.g. 2×10⁶ cells	in	2	mL per	well	of	a	24-well	plate). Incubate	at	37	°C	and	5–10%	CO₂ for	up	to	3 days. ▲ Note:	Inspect	cultures	daily,	and	add	fresh	TexMACS Medium	supplemented	with	IL-2	if	required. At	day	3	gently	pipette	cell	suspension	up	and	down	to	break	up	clumps. Split	cell	suspension	into	two	equal	parts	and	add	TexMACS Medium supplemented with IL-2. Incubate at 37 °C and 5–10% CO2. Split	cell	suspension	again	whenever	necessary	(e.g., every	2–3	days	or	when	cells reach	80%	confluency) into	two	equal	parts	and	add	TexMACS Medium	supplemented	with	IL-2. Incubate	at	37	°C,	5–10%	CO2. ▲ Note: The	ideal	starting	cell	density	for	T cell	expansion	is	1–2×106 T	cells	per	mL. Inspect	the	cell culture daily. Depending	on	the	expansion	rate,	it	might	be	necessary	to	split	the	culture	more	frequently	than every	2–3	days. If	IL-2	interferes	with	downstream	experiments,	it	can	be	omitted. However,	omission	will	lower	the	cell	viability. At	day	14,	resuspend	T	cells	at	2.5×106 cells	per	mL	in	fresh	TexMACS Medium	supplemented	with	IL-2. For	longer	expansion periods,	restimulate the	cells by	adding	one	loaded	Anti-Biotin MACSiBead Particle	per	two	cells. To	this	end, count	the	cells	and	add	12.5	μL	loaded	AntiBiotin	MACSiBead Particles	per	2.5×106 T	cells. Further	cultivate	cells	and	repeat	steps	8	and	9 every	2–3 days. ▲ Note: Inspect	the	cultures	daily. Depending	on	the	expansion	rate,	it	might	be	necessary	to	split	cultures more	frequently	than	every	2–3 days. Proceed	to	downstream	application,	e.g., analysis	of	cells. ▲ Note: Removal	of	Anti-Biotin	MACSiBead Particles	is not	required	for	immunofluorescent	staining. For	assays	where	T	cells	are	required	to	return	to	a	fully	resting	state prior	to	further	stimulation,	Anti-Biotin MACSiBead Particles	should	be	removed	at	least	24	hours before restimulation (see "Removal	of	MACSiBead Particles"). ▲ Note:	Highly	activated	T	cells	might	down-regulate	CD3 to	some	extent. Alternatively, CD4	and	CD8	stainings	(e.g., with	CD4-VioBlue® and	CD8-VioGreen™)	can	be	used	to	properly	gate	on	T	cell	subpopulations. For	analysis of	T	cell	activation, samples	are	taken	48 hours	after	stimulation	and	stained for	early	activation	markers CD25	and	CD69	to	determine	the	proportion	of	activated	cells	among	viable	CD3+ T	cells. Highly	activated	T	cells	might	down-regulate	CD3	to	some	extent. Alternatively, CD4	and CD8	stainings	(e.g., with	CD4-VioBlue and	CD8-VioGreen) can	be	used	to	properly	gate	on	T	cell	subpopulations. Additional	antibodies	can	be	included	in	the	analysis	according	to	the	respective	needs. Learn more about our antibodies and dyes. This specific	panel	is	compatible	with	CFSE	labeling. When modifying	the	antibody	panel,	make	sure to	use	fluorochrome-conjugated antibodies	that	do	not	interfere	with	CFSE	analysis	(see "CFSE	labeling	for	analysis	of	cell proliferation")	or	use	separate	wells	for	CFSE labeling. Remove	a	small	aliquot	from	samples	(e.g., stimulated	sample	and	unstimulated	control). Centrifuge	cell	suspension	at	300×g	for	10 minutes. Aspirate	supernatant	completely. For	each	sample, resuspend	up	to 1×106 nucleated cells in 100	µL activation marker master mix (see antibody panel for activation markers in "Things to prepare in advance"). ▲ Note: Higher	temperatures	and/or	longer	incubation	times	may	lead	to	non-specific	cell	labeling. Working	on	ice	requires	increased	incubation	times. Wash	cells	by	adding	1–2	mL	of	buffer	and	centrifuge	at	300×g	for	10	minutes. Aspirate	supernatant	completely. Resuspend	cells in	a	suitable	amount	of	buffer	(e.g. 500	µL)	for	analysis	by	flow	cytometry. ▲ Note:	Add	propidium	iodide	according	to	the	manufacturer’s	instructions	before	flow	analysis. Pan T	cells	were	isolated	from	human	PBMCs using	the	Pan T	Cell	Isolation	Kit,	human. Cells	were	fluorescently	stained	with	CD3,	CD25, and	CD69 antibodies 48 hours	after	activation using	the	T	Cell	Activation/	Expansion	Kit,	human (TCAE)	and	TexMACS Medium. Non-stimulated	cells	served	as	a	control. (A) Flow	cytometry analysis	of	CD25	and	CD69	performed	on	the	MACSQuant Analyzer	10. (B) Frequencies of	CD69+ and	CD25+CD69+	Pan	T	cells	with	and	without	stimulation	using	the	T	Cell	Activation/Expansion	Kit,	human	(n = 9). For	monitoring	cell	proliferation, samples of	25–50 µL are	taken	at	appropriate	time points	(e.g.,	days	6,	8, and 10),	diluted	1:2	with	buffer, and	CFSE	dilution	is	measured	on the	MACSQuant® Analyzer	10. At	least	20,000	events	are	recorded. ▲ Note: Time	points	can	be	modified to	meet	experimental	needs. For	determination of	the	cell expansion	rate, samples are	taken	at	appropriate	time points	(e.g.,	days	3,	6,	8,	10,	13,	14)	and	the	count	of	viable	cells	is	measured	on the	MACSQuant Analyzer 10. For	dead cell	exclusion, PI	is	added	prior	to	flow	cytometry acquisition. Expansion	rate	is	calculated	afterwards. Analysis	of	cell	proliferation. 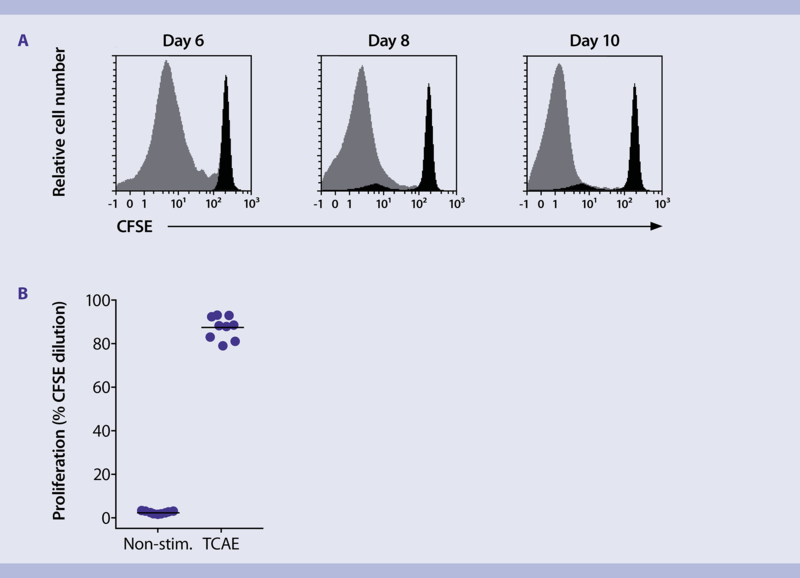 (A)	Cell	proliferation of	human	Pan	T	cells was	analyzed	by	CFSE	labeling	at	days	6,	8, and	10	after	activation	with	the	T	Cell	Activation/Expansion	Kit,	human	(TCAE). CFSE	dilution	was	determined	using	the	MACSQuant Analyzer	10. Gray:	cells stimulated	with TCAE;	black:	non-stimulated	control. 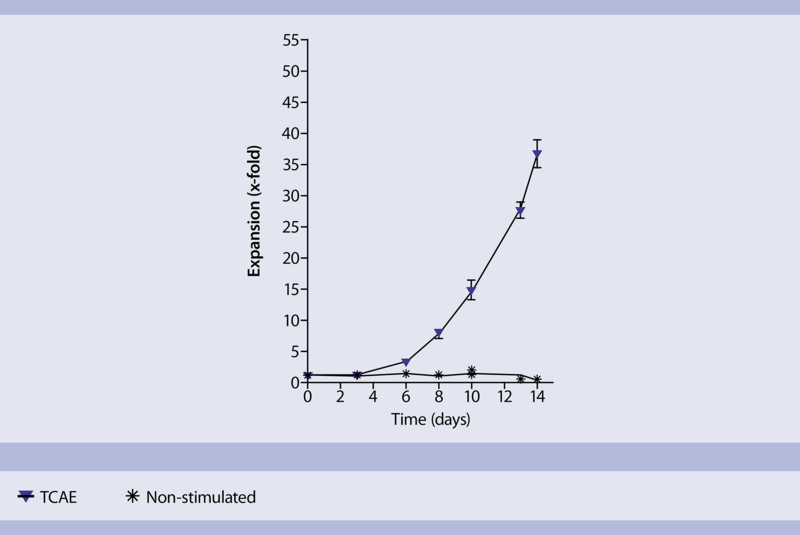 (B)	Proliferation	rate	6 days after	activation	with	the	T	Cell	Activation/Expansion	Kit,	human	(n = 9). (A)	Cell	proliferation of	human	Pan	T	cells was	analyzed	by	CFSE	labeling	at	days 6,	8, and	10	after	activation	with	the	T	Cell	Activation/Expansion	Kit,	human	(TCAE). CFSE	dilution	was	determined	using	the	MACSQuant Analyzer	10. Gray:	cells stimulated	with TCAE;	black:	non-stimulated	control. (B)	Proliferation	rate	6 days after	activation	with	the	T	Cell	Activation/Expansion	Kit,	human	(n = 9). Analysis	of	cell	expansion. For	the	determination	of	the	expansion	rate, samples were	taken	at	the	time-points	indicated	and	the	count	of	viable	cells	was	measured	with	the	MACSQuant Analyzer	10. For	dead cell	exclusion, PI	was	added	prior	to	flow	cytometry acquisition. Expansion	rate	was	calculated	afterwards. For	the	determination	of	the	expansion	rate, samples were	taken	at	the	time-points	indicated	and	the	count	of	viable	cells	was	measured	with	the	MACSQuant Analyzer	10. For	dead cell	exclusion, PI	was	added	prior	to	flow	cytometry acquisition. Expansion	rate	was	calculated	afterwards. For	some	experiments	(e.g., restimulation	of	T	cells), it	is	recommended	to	remove	the	MACSiBead Particles	from	the	cell	suspension. Harvest	cells	and	pool	cells	from	wells	that	were	treated	under the	same	conditions. Wash	empty	wells	with	cold	buffer	to	rinse	out	the	remaining	cells	on	the	plate. Wash	cells	with	cold	buffer. Resuspend	cells	in	buffer	at	a	density	of	up	to	2×107/mL	and	vortex	thoroughly. Place	the	tube	in	the	magnetic	field	of	the	MACSiMAG™ Separator. Allow	the	MACSiBead Particles	to	adhere	to	the	wall	of	the	tube	for	4	minutes. With	the	tube still	placed in	the	MACSiMAG Separator,	carefully	remove	the	supernatant	containing	the	cells	depleted	of	MACSiBead Particles. Transfer	cells	to a	new	tube. Remove	the	tube	from	the	separator	and	add	the	same	volume	of	buffer	as	before. Vortex	sample,	place	tube	in	the	MACSiMAG Separator	and	repeat	steps 6–7. Collected	cells	can	now	be	further	processed	as	required.